During the Archery Clinic, athletes will be introduced to and taught the finer points of the sport of target archery. 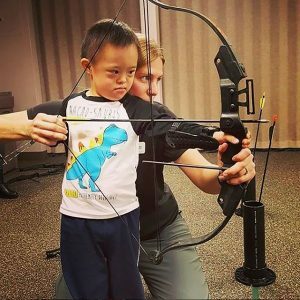 The NSCD will provide re-curve and compound bows that will be appropriate for athletes of all ages, levels and abilities. If you have your own archery gear please feel free to bring that for personal use. You will receive instruction from a USA Archery Level II instructor who is well-versed in the new and traditional forms of archery and how to achieve success in each style. Whether you are a new archer or an old pro looking for some feedback and a range to practice on, this program is a great fit for you. Participants must be independent and manage self-care or bring a care-giver to provide assistance. The NSCD partners with the Denver Police Department and Craig Hospital to offer an adaptive airgun training program. The program began with a grant from Adaptive Sports USA to bring adaptive air rifle skills and competitions to veterans in seven cities across the US. Joined by Paralympic Coach Roger Sak, the military veterans joined a national community-based outreach program, providing resources and education, conducting regional and national competitions and providing access to international competitions. The Denver Adaptive Airgun Team (DAAT)’s success has enabled the program to continue, and it is now open to anyone with a disability and free to military veterans. DAAT is an air rifle and air pistol shooting program for participants of all abilities. DAAT is a great chance to try the sport of airgun as well as an opportunity for established marksmen to hone their skills and share shooting experience/expertise with their peers. Participants must be independent and manage self-care or bring a care-giver to provide assistance.